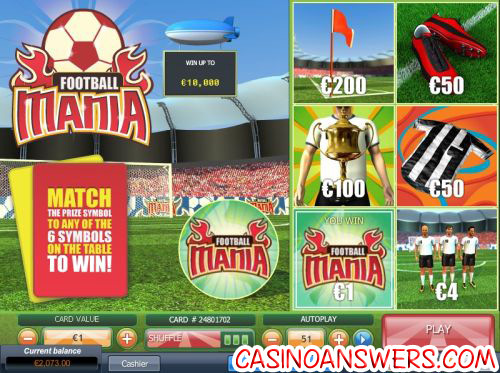 Football Mania Scratch Card Guide & Review - Casino Answers! Football Mania is an instant win scratch card game developed by the popular casino software provider Playtech. You can play Football Mania at Jackpot Scratch. Football Mania is a scratchie game with a football (or soccer) theme. You can win up $100,000 (or whatever your preferred currency is) on the Football Mania scratch card. It is a very easy game to play and also a lot of fun. To play the Football Mania scratch card, first you must set your card value. Available card values in Football Mania are $0.50, $1, $2, $5 and $10. As with any online casino game, the more you bet, the more you can win. Once you have selected a card value, hit the “Play” button. Your goal in Football Mania is to match the prize with one of the six game panels. You can either hit the “Scratch All” button, which will instantly reveal all of the panels or you can scratch each one individually. The symbols in Football Mania are a pair of boots, a golden whistle, a trophy, a ball, a goal, a referee, playing kit, corner flag and the special Football Mania logo. Whenever you get a match, you will be treated to that symbol’s animation. Each panel in Football Mania has its own prize. This will change from game to game. If you’re looking to play a lot of games of Football Mania in rapid succession, Football Mania has an autoplay feature available to you. You can play up to 99 games automatically at a time. Football Mania is a great scratch card for the sports fans out there. It is very easy to play, has nice looking 3D art and animations and some cool sound effects as well. If you’re looking for a sports-themed scratch card game, we recommend you check out Football Mania at Jackpot Scratch! Are players in the United States welcome to play Football Mania? US players are prohibited from playing Football Mania for real money at Jackpot Scratch. For a US-friendly online casino that has a lot of great scratch cards and bonuses specifically for scratch card players, check out This is Vegas Casino. Do I need to download any casino software to play Football Mania? Football Mania is played in your web browser with no download required. If you don’t have Flash installed on your computer, you can download the newest version of Adobe Flash Player. What kind of bonus can I find at Jackpot Scratch? Not only does Jackpot Scratch have a $7 no deposit bonus (available in EUR and GBP), but when you make your first deposit there, you can get a 100% up to $250 signup bonus! What are my chances of winning on the Football Mania scratch card? Football Mania boasts a 1-in-3 average hit frequency. This doesn’t mean you will win every three games, only that you have a good shot of winning once every three games you play. How do I win in the Football Mania scratch card? To win, all you have to do is match your prize symbol (which is hidden under the football) to any one of the six panels on the scratch card. When you win, you will hear a sound effect and your symbol will become animated. What soccer related scratch card games are there? Football scratch cards? Soccer scratch cards?